It is better for a man to leave one ḥarām dirham than to give one hundred thousand in charity. Abū Bakr Al-Daynūrī, Al-Mujālasah wa Jawāhir Al-ʿIlm 5:125. There is no good in this life except for one of two men: a man listening carefully, receiving and holding [knowledge]; or someone knowledgeable speaking. Ibn Ḥibbān, Rawḍatu Al-ʿUqalāʾ 1:42. There will come upon the people a time when their hearts will be derelict of the Qurān; they will find neither sweetness nor pleasure by it. If they fall short of doing what they have been commanded to do, they will say: Allāh is most forgiving, merciful (He will forgive us), and if they do what they have been forbidden from doing, they will say: we will be forgiven, we haven’t committed any shirk with Allāh. Their affairs will all be based on [false] hope, having no truth and sincerity with it. They will wear the skins of lambs over hearts of wolves. The best of them in his religion will be someone who compromises. Imām Aḥmad, Al-Zuhd article 1741. Men are of four types: There is the man who knows and he knows that he knows. He is knowledgeable, so follow him and ask him. And there is the man who does not know, and he knows that he does not know. He is ignorant, so teach him. And there is the man who knows, but he does not know that he knows. He is heedless, so remind him. And then there is the man who does not know, but he does not know that he does not know (he thinks he knows). This is the fool (idiot), so beware of him. Ibn ˁAbd Al-Barr, Jāmiˁ Bayān Al-ˁilm wa Faḍlihī article 1538.
Who Can Feel Secure From Trial? Al-Dhahabī, Siyar ʾAʿlām Al-Nubalāʾ 4:49. Do not sell food or clothes to them, and do not buy from them. And he said, The Khawārij are renegades, an evil people. O people! Fear Allāh and obey Him, for piety is a valuable prize. Verily the most intelligent person is he who takes account of himself and works for what comes after death, and acquires through the light (guidance) of Allāh a light for the darkness of the grave. The servant of Allāh should fear lest Allāh the Mighty and Sublime resurrects him blind though he used to see. A few comprehensive words can be enough for a wise man, whereas the deaf (who does not listen to guidance) is being called from afar. And know that whoever Allāh the Mighty and Sublime is with has nothing to fear; but whoever Allāh the Mighty and Sublime is against, then in whom can he hope after Allāh?! Abū Bakr Al-Daynūrī, Al-Mujālasah wa Jawāhir Al-ʿIlm 4:116,117. Whatever you fool around with, don’t fool around with your dīn (religion). A man from his people, from the Anṣār, went out one night to pray ʿIshāʾ with his people [during the Caliphate of ʿUmar], but some jinn abducted him, and he went missing. His wife went to ʿUmar and told him [of her missing husband]. ʿUmar asked his people about him, and they confirmed that he had gone out to pray ʿIshāʾ but had gone missing. [ʿUmar] told the woman to wait for four years. ʿUmar ruled that the man had a choice to either get back the ṣadāq (dowry) he had given [and have his marriage stay nullified], or take back his wife. It has reached me that the scholars of old would practice what they learned when they learned it, and through practicing they would become occupied, and because of being occupied, they would be missed, and when they were missed they were sought after, and when they were sought after they would flee. Will you not fight? For you are one of the people of shūrā (to be consulted in these affairs), and you are more deserving of this matter (leadership) than others? So he replied: I will not fight until you bring me a sword with two eyes and lips that recognizes the believer from the unbeliever, for I have done jihād and I know jihād. It is reported that ʿAbdullāh b. Masʿūd – Allāh be pleased with him – said: There is no comfort or rest for the believer until he meets Allāh. It is reported that Masrūq – Allāh have mercy him – said: There is no house better for the believer than the niche of his grave, for then he will rest from the worries of this world, and be secured from the punishment of Allāh. It is reported that Al-Rabīʿ b. Khuthaym – Allāh have mercy him – said: There is nothing that is away from the believer, and for which he waits, better for him than death. Woe to you, say what is good and you will reap gain, and be silent from speaking evil and you will be safe. O Ibn ʿAbbās, what is the matter that I see you holding the tip of your tongue saying such-and-such? It has reached me that the servant of Allāh will not be as angry at anything on the Day of Resurrection as he will be at his tongue. Tawakkul (reliance and trust in Allah) comprehends all of Īmān. Hunād b. Al-Sarī, Al-Zuhd #534. Al-Rabīʿ b. Khuthaym used to come to ʿAlqamah on the day of Jumuʿah and they would talk. They would call for me and I would come and talk with them. One day, they sent for me and I came. ʿAlqamah said to me, Have you not heard what Al-Rabīʿ b. Khuthaym has come to us with? I replied, And what is that? He said, [Rabīʿ] said a man from the People of Scripture once said to us, Do you not see how much people supplicate but how seldom their prayers are answered? That is because Allāh does not accept except what is sincere and purely for Him. I said, Well ʿAbdullāh [b. Masʿūd] already said the same. He asked, What did he say? I replied, Haven’t you heard him say, By Him other than whom there is none worthy of worship, Allāh does not accept [the deed] of one who seeks to be heard of, or seen, and nor someone who is playing around, [He only accepts the supplication] of one who calls upon Him from the bottom of his heart. He replied, Indeed, [I have heard him say that]. Hunād b. Al-Sarī, Al-Zuhd #874. When did you Get so Harsh? I saw Zuhayr b. Muʿāwiyah come to Zāʾidah b. Qudāmah (d.160H) and speak to him to get him to narrate ḥadīth to a man, so Zāʾidah asked, Is he from Ahl Al-Sunnah? Zuhayr replied, I do not know that he has any bidʿah. Zāʾidah said, No, that is another matter! Is he from Ahl Al-Sunnah? Zuhayr said, Since when have people become like this? Zāʾidah replied, Since when did people curse Abū Bakr and ʿUmar?! Al-Khaṭīb Al-Baghdādī, Al-Jāmiʿ li Akhlāq Al-Rāwī #754. How will you be (in the end times) when you open up your religion like the woman who opens her legs to expose her qubul not stopping anyone from coming to her? Verily, you will find the believer (muʾmin) consistent time after time, upon one way, showing the same face; [whereas] you will find the hypocrite (munāfiq) changing colors, trying to be like everyone around him, running with every wind. We used to sometimes come to a scholar and what we learned of his manners was more beloved to us than the knowledge we took from him. Please write down all knowledge for me. Ibn ʿUmar replied: Knowledge is vast, but if you can meet Allāh having kept your back light of the burden of people’s blood, your stomach void of people’s wealth and having kept your tongue from [disparaging] their honour, then do so. Do not mix except with those who have good character; for the one who has good character brings nothing but good, whilst the one who has bad character brings nothing but evil. The example of the scholars on earth is that of the stars in the sky: when they appear, the people are guided (they navigate using the stars), but when they disappear, the people get confused and lost. It is reported that Imām Al-Shāfʿee – Allāh have mercy on him – said, The loftiest in status are those who do not know their own status, and the most virtuous of them are those who do not know their own virtue. It is reported from Sufyān b. ʿUyainah – Allāh have mercy on him – that a man once asked ʿAlī b. Ḥusayn b. ʿAlī b. ʾAbī Ṭālib – Allāh have mercy on him, What was the status of Abū Bakr and ʿUmar with Rasūlullāh – Allāh’s praise and peace be upon him? He replied, Their place with him is like their place with him today (i.e. where they are in their graves). It is reported from Ḥammād b. Zayd that he said, I never saw a man who used to smile more at people than ʾAyyūb. It is reported from Ḥammād b. Zayd that ʾAyyūb [Al-Sakhtiyānī] was once in a gathering when he was effected (moved to tears) by an exhortation, so he began wiping his nose saying, How severe a cold can be! It is also reported from Ḥammād that ʾAyyūb was once overcome with weeping, so he said, A shaykh, when he gets very old, dribbles. It is reported that a man came to ʿAlī – Allāh be pleased with him – and asked, What do you think about a man who committed a sin? He replied, He must seek Allāh’s forgiveness and repent to Him. [The man] said, He did that, but then sinned again? [ʿAlī] said, He must seek Allāh’s forgiveness and repent to Him. The man again said, He did that, but returned to sin . [ʿAlī] said, He must seek Allāh’s forgiveness and repent to Him. The man said for the fourth time, He did, but then sinned again. ʿAlī then said, Until when? Then he said, He must seek Allāh’s forgiveness and repent to Him; and not give up until it is Shayṭān who is defeated [overcome]. It is reported that a shaykh (older man) once came and greeted ‘Alī – Allāh be pleased with him, wearing a cloak decorated with silk at the front. He said to the man, What is this filth under your beard? The man looked around and said, I do not see anything. Another man said, He means the silk embroidery. The shaykh said, In that case, we will throw it away and never wear [such a thing] again. A cushion was once passed to ‘Alī – Allāh be pleased with him, upon which he sat, and said, None but a donkey refuses good treatment (honour/respect). Sa’īd b. Manṣūr, Al-Sunan. See Al-Albānī, Al-Ḍa’īfah 12:465, where he graded the chain of narration ṣaḥīḥ. Delving into falsehood removes the ability to recognize the truth from the heart. Abu Nu’aym, Hilyatu Al-Awliyā` 8:22. Three things are from Imān: when a man has nocturnal emission during a cold night, so he gets up – only Allāh sees him, and has a full wash; when a person fasts on a hot day; and when a man prays in a barren land, where none but Alāh sees him. Those before you used to consider idle talk to be anything other than the Book of Allāh, or the enjoining of good, or the forbidding of evil, or speaking for the sake of your basic living needs. Do you deny that there are recording angels appointed over you? Sitting on your right and your left? Never is a word said except there is an observer prepared to record? Are you not afraid (ashamed) that your record of words and deeds be spread open only to discover that there is nothing of the hereafter in it? I do not know anything rarer than a good dirham (money earnt lawfully) whose owner spends it on something right, or a brother in Islām in whose company one finds peace. And they are only getting rarer. First, he should have a [firm and good] intention; for if he does not, he will have no light upon him, and nor will his words. Second, he should be forbearing, tranquil and serene. Third, he should be strong upon what he is involved in, strong in its knowledge. Fourth, he should have sufficient means (wealth), otherwise the people will chew him up. Fifth, he should know people and their ways. Ibn Battah, Ibtāl Al-Hiyal p24. This is one of the proofs of the eminence of Imām Ahmad and his lofty status in knowledge and insight; for these five are the pillars of fatwā, and to the extent that there is deficiency in any of them, to that extent faults will appear in the mufti. You will remain in a good state as long as you do not approve what you used to know to be wrong or censure what you used to know to be right, and as long as the knowledgeable (scholar) amongst you can speak amongst you without fear. Ibn Battah, Al-Ibānah Al-Kubrā article 26. Abū Bakr is our sayyid (master/leader), and he freed our sayyid – meaning Bilāl. I have been among people who I would feel ashamed to speak in front of. And I have been among people who only spoke the truth or kept silent. And I have been among people who had never really seen the sky: they had not looked up with their eyes, for fear of their Lord. Who are The Jama’ah (Main Body of the Muslims)? If you ask the ignorant: ‘Who are Al-Sawād Al-Aʿẓam (Main Body of the Muslims)?’ they will say, ‘All the people (together).’ But they do not know that The Jamā’ah (Main Body) is a scholar who follows the footsteps of the Prophet – Allāh’s praise and peace be upon him – and his way. So whoever is with him and follows him is [one of] The Jamā’ah, but whoever contradicts him in it leaves The Jamā’ah. I would sometimes go with Ayyūb for some need, but he would not let me walk with him; he would move here and there in case people noticed him. Whoever sees a wrongdoing from his brother and then laughs in front of him has betrayed him. Those who will be taken to account most on the Day of Resurrection are those who were healthy and unoccupied. Verily, the Messenger of Allāh – peace and blessings be upon him – is the highest standard; things are measured by him: his character, lifestyle and behavior. Whatever agrees with [these] is true and correct, and whatever contradicts [them] is wrong. Al-Khatīb Al-Baghdādī, Akhlāq Al-Rāwī wa Ādāb Al-Sāmi’ article 8. If the Dajjāl appears, I believe the heretics (People of Desires, Bid’ah) will follow him. Do not be impressed by the twitter of an individual. But one who fulfils his duty and trust, and refrains from [transgressing against] the honor of people is the real man. Al-Bayhaqī, Al-Sunan Al-Kubrā article 12345. I find it amazing how anyone who passed through the urinary tract twice could ever be arrogant and haughty! Al-Dhahabī, Siyar A’lām Al-Nubalā` 4:92. The people will remain upon goodness as long as knowledge comes to them from the Companions of Allāh’s Messenger – Allāh’s praise and peace be upon him, and from their seniors. But when knowledge comes to them from their minors, that is when they will be destroyed. Ibn ‘Abd Al-Barr, Jāmi’ Bayān Al-‘Ilm wa Fadlihi article 1060. Being upon a good and right path is based on following the knowledge of the Companions and seniors: scholars and people who adhere to the Sunnah, whereas taking knowledge from minors like ignorants and heretics is a sign of destruction. Zuhd (abstinence from materialism, asceticism) is of three types: (i) obligatory zuhd, (ii) virtuous zuhd and (iii) zuhd for safety. Obligatory zuhd is to abstain from what is forbidden (harām); virtuous zuhd is to be disinterested in what is allowed (of this world); and zuhd for safety is to stay away from doubtful matters. Abū Bakr Al-Daynūrī, Al-Mujālasah wa Jawāhir Al-‘Ilm article 905. Ibn Abī Al-Dunyā, Dhamm Al-Dunyā article 53. Whenever Ibn ‘Umar – Allāh be pleased with him – heard a hadīth from Allāh’s Messenger – Allāh’s praise and peace be upon him – he never went beyond it, and he never fell short of it. Ibn Mājah, Al-Sunan, hadīth #4. Shaykh Al-Albānī graded this narration sahīh in his edition of the Sunan. Shaykh Al-Albānī explained that ‘he never went beyond it’ means: he never added anything to what was in the hadīth or overstepped the bounds of the hadīth; and ‘he never fell short of it’ means: he never neglected what was in the hadīth. Al-Dhahabī, Siyar A’lām Al-Nubalā` 7:116. To (be guaranteed) one day in which I issue correct and just verdicts (fatwā) is more beloved to me than fighting in battle (ghazwah, jihād) for a year. Al-Dhahabī, Siyar A’lām Al-Nubalā` 4:66. Verily, knowledge has calamities [that afflict it]. One of its calamities is when the scholar is left, until he goes away with his knowledge. Another calamity is forgetting [knowledge]. Yet another calamity is lying about [knowledge], and this is the worst type. Ibn ‘Abd Al-Barr, Jāmi’ Bayān Al-‘Ilm article 684. Ibn Al-Mubārak, Al-Zuhd wa Al-Raqā`iq article 538. Abū Bakr Al-Daynūrī, Al-Mujālasah wa Jawāhir Al-‘Ilm article 3438. O people! Yes, I am a man from Quraysh, but there is not a white man (literally: red), nor a black man amongst you who exceeds me in righteousness (taqwā) except that I wish I was in his skin. If the heretic started mentioning his bid’ah right at the beginning of the sitting, you would be on your guard and flee from him, but what he does is begin by mentioning hadīth from the Sunnah. Then, he slips his bid’ah in on you. It might then stick to your heart; but when will it leave your heart? Al-Bayhaqī, As-Sunan Al-Kubraa 2:466. graded sahīh by Shaykh Al-Albānī. See Irwā Al-Ghalīl 2:236. This is one of the superb answers given by Sa’īd b. Al-Musayyib – Allāh have mercy on him. It is a strong weapon against heretics (mubtadi’ah) who recommend many different types of religious innovation in the name of them being dhikr and prayer. They then criticize the followers of the Sunnah for criticizing them, and accuse them of censuring dhikr and prayer, when in fact [Ahl Al-Sunnah] are only criticizing the contravention of the Sunnah in matters such as dhikr and prayer. Whoever seeks praise by going against the truth, Allāh will throw it back upon him as blame, and whoever faces blame in order to conform to the truth, Allāh will return it as praise for him. Al-Dhahabī, Siyar A’lām Al-Nubalā` 4:540. How surprising it is that the companions of ‘Abdulāh (ibn Mas’ūd) are looking now to see where the sun rises from. Do they not know that when Fajr comes from a direction, the sun rises from the same? Ibn Abī Shaybah, Kitāb Al-Adab articles 156 and 157. He was asked, “How is that o Abū ‘Abdillāh”? It is reported that ‘Umar b. Al-Khattāb came out one Eid. Passing by a group of women, he could smell the scent of perfume from one of them. He asked, “Who is the one wearing this scent? By Allāh, if I knew who she was, I would do such-and-such (punish her). A women is only to wear perfume for her husband, and if she goes out, she wears her older (scruffier) clothes or the older clothes of her servant.” And so it was rumored amongst the women that the woman [who was wearing perfume in public] got up from that gathering having soiled herself (out of fear). Ibn Abī Shaybah, Al-Musannaf article 6387. To learn a single topic of knowledge and teach it to a Muslim is more beloved to me than having the whole world and giving it in the cause of Allāh. Al-Khatīb Al-Baghdādī, Al-Faqīh wa Al-Mutafaqqih article 53. By Allāh, he who gives people verdicts (fatwā) for every question they ask him is crazy (majnūn). Ibn Battah Al-‘Ukbarī, Ibtāl Al-Hiyal article 81, et al. It is only the storyteller-preachers (al-qusās) who have killed knowledge. A man listens to a storyteller for a year without really learning anything that will last, whereas a man who sits with a scholar for an hour learns what will last and benefit him before he even gets up. Abō Nu’aym, Hilyatu Al-Awliyā` 2:287. Ink on the clothes is the perfume of the scholars. These are the lanterns of Islâm. Al-Khatîb Al-Baghdâdî, Al-Jâmi’ li-Akhlâq Al-Râwî, articles 508, 509, 512 . I love you for Allâh. Then bear witness that I hate you for Allâh! Al-Tabarânî, Al-Mu’jam Al-Kabîr, article 13059; from Shaykh Al-Albânî, Al-Sahîhah 1:104, where he grades it authentic. I sat in the circle of Abû ‘Abdillâh Ahmad b. Hanbal for twelve years while he read the Musnad to his children, and I never wrote a single hadîth, I only looked at his behavior, character and etiquette. Ibn Al-Jawzî, Manâqib Ahmad, article 210. A man who wanted to write hadîth would [learn] manners and worship for twenty years before starting. Abû Nu’aym, Hilyatu Al-Awliyâ`, 6:361. I used to have a neighbor from the Ansâr who lived in the area of Banî Umayyah b. Zayd, which is in the ‘Awâlî of Medinah, and we used to take turns attending [the gatherings] of Allâh’s Messenger – Allâh’s praise and peace be upon him. My neighbor would attend one day and I the other; so when I attended I would convey to him the reports about the revelation that had come, and other such news, and when he attended he would do the same. Al-Bukhârî, Al-Sahîh, Chapter on Taking Turns in Seeking Knowledge. The narration translated above is a shorter report of the full incident, recorded elsewhere in Sahîh Al-Bukhârî. 1. This hadith shows us that the khabar (news, report) of a single (reliable) person is dependable. 2. The student of knowledge should not neglect taking care of his living needs, in order to help him continue seeking knowledge and other pursuits (at that time, ‘Umar was involved in trade, as is mentioned in other reports). 3. At the same time, the student of knowledge should be diligent and resolute in asking about the knowledge he has missed in his absence. It has reached me that when Allâh the Mighty and Majestic blesses a people and gives them some good he asks them to be grateful. If they are grateful, He is all-able to give them more. But if they are ungrateful, He is all-able to turn His blessings into a punishment. Al-Bayhaqî, Shu’ab Al-Imân article 4536. Here is a picture of what is considered (to date) the oldest dated Islamic inscription, from 24H, when the Rightly Guided Caliph ‘Umar b. Al-Khattâb – Allâh be pleased with him – was assassinated. It is located at Al-‘Ulâ in present day Saudi Arabia. It is one of a number of ‘graffiti’ inscriptions made by travelers and pilgrims from the first few centuries of Islâm. Saudi Arabia – Earliest Islamic (Kufic) Inscription. 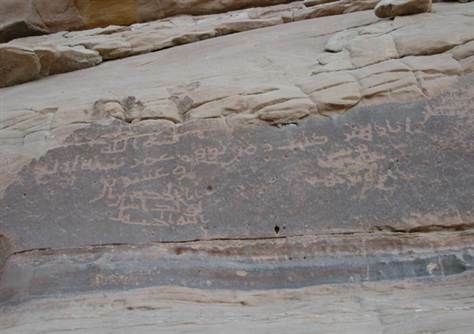 This very well preserved inscription is located on a red sandstone block of rock south of Qa’a al Muatadil, north of Sharma in al-Ula, northwest of Saudi Arabia on the ancient trade and pilgrimage route connecting the early Islamic city of al-Mabiyat with Madain Saleh. It is the oldest Islamic inscription found so far. It mentions the date of the death of the second Caliph of Islam, Omar bin al-Khattab and reads as follows: “In the name of God, I Zuhair wrote the date of the death of Omar the year four and twenty (Hegrah)”. Caliph Omar bin al-Khattab died on the last night of the month of Dul-Hajj of the year 23 Hegrah, and was buried next day on the first day of Muharram of the new year 24 Hegrah (corresponding to 644 AD). Note: The discoverers and local experts say the script is Hijâzî, not Kufic. One who acts without knowledge is like one who travels off the path; and the one who acts without knowledge corrupts more than he rectifies. So seek knowledge in a way that does not harm your worship, and seek to worship [Allâh] in a way that does not harm [your seeking of] knowledge. For verily, there were people (the Khawârij extremists) who sought to worship [Allâh] but abandoned knowledge until they attacked the Ummah of Muhammad – Allâh’s praise and peace be upon him – with their swords. But if they had sought knowledge, it would not have directed them to do what they did. Quoted by Ibn ‘Abd Al-Barr, Jâmi’ Bayân Al-‘Ilm wa Fadlihi article 905. When Anas b. Mâlik – Allâh be pleased with him – used to finish a complete reading of the Qur`ân he would gather his wife and children and supplicate for them. Al-Firyâbî, Fadâ`il Al-Qur`ân article 83; Al-Dârimî, Al-Sunan hadith 3477 et al. Shaykh Al-Albânî graded one of its chains of transmission sahîh. See Marwîyât Du’â Khatm Al-Qurân article 12. The Sunnah of Al-Fitr consists of three things: Walking to the prayer place (musallâ), eating before leaving [for the prayer] and taking a full bath. Al-Firyâbî, Ahkâm Al-‘Eidayn. Shaykh Al-Albânî graded its chain of transmission sahîh in Irwâ` Al-Ghalîl 3:104. Allâh the Mighty and Sublime laughs at two men [being pleased with them]: a man who stands in the middle of the night while his family sleeps; he purifies himself and stands in prayer, so Allâh laughs at him. And a man who meets the enemy [in battle] and his comrades are defeated; but he stands his ground until Allâh the Mighty and Sublime gives him martyrdom. Abû Bakr Al-Âjurrî, Fadl Qiyâm Al-Layl, article 9. Note: A longer version of this narration is reported from Allâh’s Messenger himself – praise and peace be upon him – in the Musnad of Ahmad and other collections. Shaykh Al-Albânî grades it good based on other corroboratory reports (hasan lighayrihi). See Sahîh Al-Targhîb wa Al-Tarhîb article 630. There were people who abandoned knowledge and sitting with the scholars, and [instead] took to their chambers and prayed until their skin dried [from exertion in worship]. Thereafter they began to contradict the Sunnah and thus were destroyed. By Allâh, never does a person act without knowledge, except that he spoils and corrupts more than he fixes and rectifies. Ibn ‘Asâkir, Târîkh Dimishq 8:15.